“Smart owners seeking to exit their business used the last number of years to restructure and position their business in order to maximise their sale potential and valuation on exit, “ said Ann Marie Reddy, Director at Blackthorn Capital. “A key area of focus is on internal review of their structure and legal set up, directing key management and mentoring them for their eventual exit and making strategic decisions so that the financial resources are there to enable a deal to be efficiently structured. 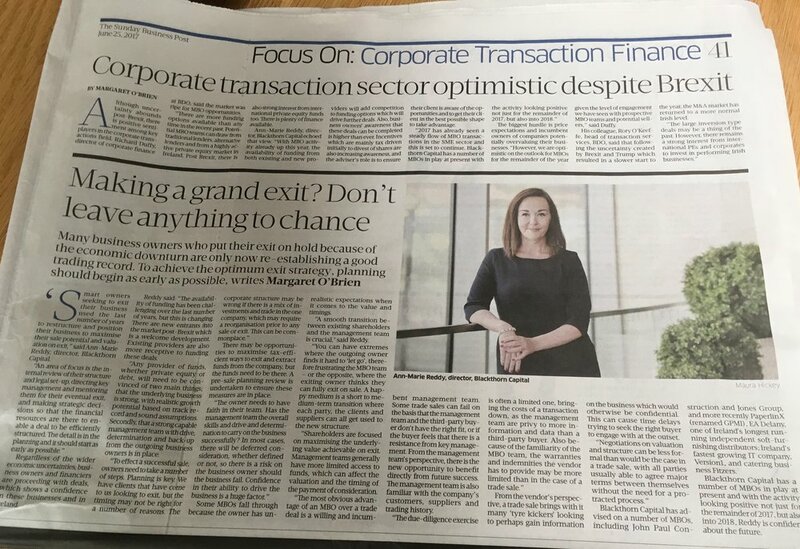 The detail is in the planning and it should start as early as possible.” She observed that regardless of the wider economic uncertainties, business owners and financiers are proceeding with deals, which shows a confidence in the businesses in question, and the market in Ireland. To effect a successful sale of a business owners need to take a number steps. “Planning is key, we have clients that have come to us looking to exit, but the timing may not be right for a number of reasons. The corporate structure may be wrong if there is a mix of investments and trade in the one company, which may require a reorganisation prior to any sale or exit. This can be commonplace. There may be opportunities to maximise tax efficient ways to exit and extract funds from the company, but the funds need to be there. There is often a pre-sale planning review undertaken to ensure that these measures are put in place. “The most obvious advantage of an MBO over a trade deal is a willing and incumbent management team,” said Reddy. “Some trade sales can fail on the basis that the management team and the third-party buyer don’t have the right fit or if the buyer feels that there is a resistance from key management. From the management team’s perspective, there is no uncertainty that new ownership would bring. There is the new opportunity to benefit directly from future success than they would do as employees only. The management team would also be familiar with the company’s customers and suppliers and trading history.” She added, “The due diligence exercise is often a limited one bringing the costs of a transaction down, as the management team are privy to more information and data than a third-party buyer. Also because of the familiarity of the MBO team, the warranties and indemnities the vendor has to provide may be more limited than in the case of a trade sale. Property in your Approved Retirement Fund (ARF)?